For nitrogen fixation and nitrogen fixing bacteria. A lot of us have been growing legumes such as peas and beans in our veggie rotations not only for their produce but for the nitrogen that we think add to the soil due to a symbiotic bacteria on their roots. The idea of using plants to provide our nitrogen fertilizer is very organic. Did you know that the bacteria that the works in symbiosis with most of our introduced legumes isn't normal in Australian soils? 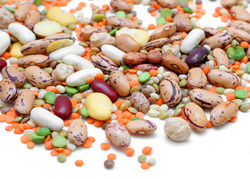 Broad beans, peas, annual bush beans, soybeans, lucerne, the clovers, tree lucerne, peanuts, lupins and other legumes all fix nitrogen in association with bacteria, however, each has its own specific type of bacteria and the strain of bacteria that suits one doesn't usually work effectively with a different legume. If the bacteria are effectively fixing nitrogen the nodules should be pink inside when young, few in number, large and bunched near the base of the plant. Ineffective nodulation can be indicated by numerous small white nodules distributed all over the plant. Molybdenum and cobalt are needed in much greater amounts for nitrogen fixing than normally required for plant growth. Phosphorus and sulphur being two other minerals required in reasonable amounts for the bacteria to effectively fix atmospheric nitrogen. A company called Biocare Technology at RMB 1084 Pacific Highway Somersby NSW 02 4340 2246 biocare@ozemail.com.au specialises in producing the strains of bacteria for sale and they are quite cheap to buy. Once the bacteria have been established in the soil they should be able to survive up to three years without a host so if you rotate legumes in the area at least every three years there should be no need to re-inoculate the seed each time. Nitrogen fixation diminishes with low pH and liming acid soils can help the process.